In addition to rodeo classics like bull riding, steer wrestling, and barrel racing, we were lucky enough to see something called mutton bustin’, which has to be the most adorable sport in existence. But what was even more impressive than watching a 5-year-old cling to a fistful of wool for dear life was seeing the sheer number of cowboys who had been blessed with spectacular names. Every single one of these guys sounded like he just walked out of a Larry McMurtry novel: Wyatt Casper, King Pickett, Levi Rudd, the list went on and on. Basically, this is all just a long way of saying that if you want to compete in Name of the Year as a cowboy, you’d better bring something extra special to the table. Which is how we find ourselves with professional team roper Bubba Buckaloo, a 15-seed underdog who knocked out 2-seed Happy Kampire to advance to the second round of competition. The Dragonwagon Wrangler burst onto the pro rodeo scene in 2007, and by 2018 was ranked fifth in the world. As the header in a team roping competition, he’s responsible for lassoing the steer’s neck, while his partner, the heeler, is responsible for roping its two hind legs. A talented team of ropers can take down a steer in as little as four seconds, and Bubba’s skills with the rope have brought in over $366k in ProRodeo earnings. But an absolutely insane bit of trivia reveals that life in the saddle isn’t always easy; Buckaloo cut off his thumb twice, once at age 11 and then again at 15. Further down the bracket in the Chrotchtangle Regional lies top-seeded Ecclesiastical Denzel Washington, who said g’night to 16-seed G’Mario Charleston in a first-round trouncing. Washington, as you may recall from last week, is a former death-row inmate who successfully petitioned the Missouri Department of Corrections to ban all tobacco products after claiming that secondhand smoke was aggravating his asthma and slowly cutting off his air supply. The irony is that Washington is serving his sentence for strangling two women to death in the late 1980s. As you may have guessed, Washington’s name was given to him not by his parents, but by the court via legal name change soon after his conviction and a religious awakening. One could posit that the man formerly known as Willie Simmons wanted to separate himself from his heinous acts. But how on earth did he settle on Ecclesiastical Denzel Washington? Is it possible that he stumbled across this NOTY post from 2007, in which the High Committee proposed the imaginary Ecclesiastes Devildog as the most perfect name possible, a true Platonic ideal? In their words, it’s “a combination of a long, familiar and ridiculous first name and absurd, two-syllable compound last name that scans beautifully.” Regardless of how E.D.W. 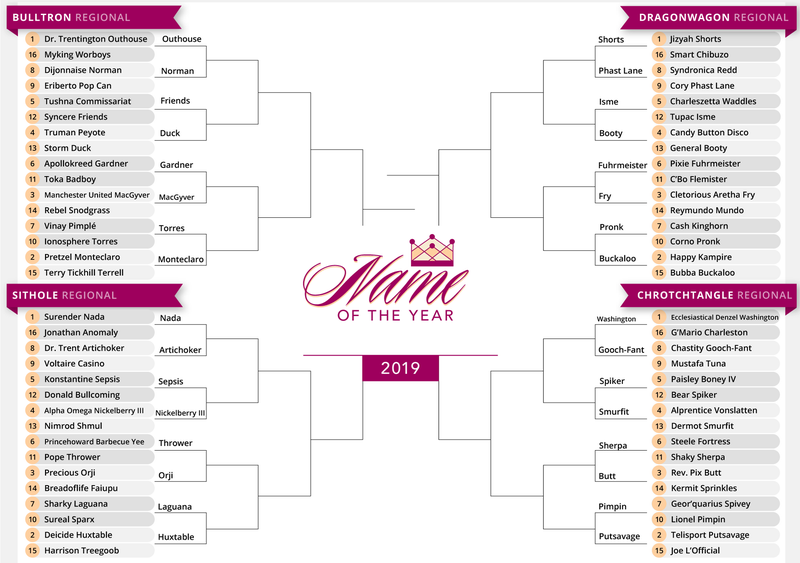 picked his moniker, we will constantly be amazed by the number of submissions that meet and exceed our expectations for what a truly great name can be. Take a look at the eight great matchups below and cast your vote. When you’re done with that, be sure to throw us a follow on Twitter and keep the submissions coming at nameoftheyear@gmail.com. Yeehaw!